Jahi isn't your average rapper. He doesn't have to just worry about flow and lyrics when he tours with Public Enemy as part of the group PE 2.0. As an educator and pioneer of the African-American Male Achievement program in the Oakland, Calif., public school system, he has to wait until summer break, when the kids are out, to tour for his new album, InsPirEd. 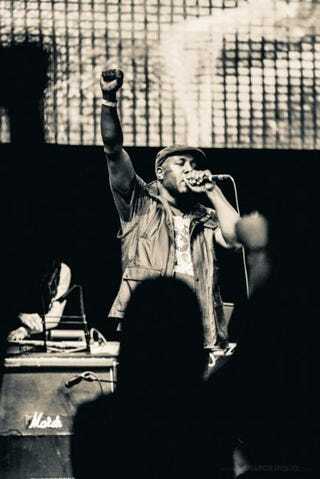 As both a solo rapper and an emcee for PE 2.0, an offshoot of Public Enemy, Jahi has had success around the world as a musician. As an educator, he is the director of Oakland's public schools' Manhood Development Program and manages 16 public school sites in Oakland. The program falls under the Office of African-American Male Achievement in the Oakland Unified School District. It is the first organization in the U.S. that unapologetically and exclusively serves black boys in a public school system. Black male teachers are teaching black male students, and it has been a qualified success, transforming the lives of both the teachers and the students. When Jahi first met the two scholars of rap, KRS-One and Chuck D, in the 1990s, he never imagined it would turn into a lifelong friendship and continued artistic and educational collaborations. He is the embodiment of a term that KRS-One once coined "edutainment," a concept that says you can educate people while you're entertaining them. He talks to The Root about how these two worlds collide. The Root: I am curious about how your two lives—artist and educator—intersect. How did you come to the African-American Male Achievement program? Jahi: Well, I was rocking with KRS-One one night in San Francisco, and after the concert, me and a brother named Chris Chatmon were together, and he was like, "You gotta meet this brother." So KRS-One and I met. I told him I was back in Oakland but had been helping sites and community centers and a school down the street from my house. He started laughing. I said, "What's funny?" He said, "My kids go to that school and that's the school where we want to pioneer AAMA." AAMA was not in middle schools; they were only in high schools at the time. Two weeks later, I was pioneering it in middle schools. Been doing it for six years now. It's the first organization in the U.S. that serves black males in a public school system. We offer grades for our class. It's not an after-school program, it's not an extra pullout. You can take it as an elective credit; it's called "Mastering our Cultural Identity," and if you're in elementary school, you get a grade as well. TR: How did the program come about? J: In 2010 the superintendent was Tony Smith, a white man who called out structural racism in the Oakland Unified School District. It was probably one of the most courageous things that could have happened. Then he created this Office of African-American Male Achievement. It was an office of one—with just Chris Chatmon. He was told, "Don't quit your day job, it's not gonna work, there's no way you're gonna be able to serve black boys only." One of our methodologies is using targeted universalism, a concept introduced by a U.C. Berkeley professor. [A targeted universal strategy is one that is inclusive of the needs of both the dominant and the marginal group, but pays particular attention to the situation of the marginal group.] Chapman did a listening campaign to try to figure out what were the big problems. What we found was that young black boys did not feel loved, appreciated or safe in public schools. They felt targeted, criminalized and devalued. We had to figure out something, almost like an inoculation—like, what can we give them right now? That's how the manhood program started. We went from year 1, with a few facilitators in a few schools to now, here we are year 6, with our Kephra curriculum, and it follows California standards and Common Core. All of our facilitators are certified teachers. We are in the forefront in the national academic discourse in how do you serve black boys with a public school education. TR: Black male teachers are teaching exclusively black boys. What does it look like on a typical day? J: We actually recruited and retained African-American males to come in and run a 10-month marathon of being a teacher in a different kind of way. We call our students "kings." If you continue to call a young black boy a king, you will see transformation. We operate out of a position of love. We operate out of an asset-based model. Public schools across the nation, by and large, are operating out of a deficit model. When it comes to black boys, it's what we don't have, what we didn't show up with. What we need. So this comes from an asset-based model. Our kings have innate greatness. We don't have to give them anything. We just have to provide the platform for that to be able to come out in a loving and safe environment. There's also advanced academic discourse. We fill in the gaps about black history and also prior to slavery. They can take revolutionary literature instead of English. Reading Malcolm X, Dr. John Henrik Clarke, Asa Hilliard, Ivan Van Sertima. We are recruiting and hand-picking brothers to be teachers. We have a 90 percent retention rate for teachers, which is better than the entire Oakland Unified School District. They have a teacher shortage. So part of it is buy-in. Do you really want to make a change in your neighborhood? The level of maturity and personal belief and self-efficacy and advocacy in them is amazing. They know how to show up. Transformed how they relate to their families and communities. Take trips around the nation to speak about what they do. That's been life changing. This year, students won $16,000 in scholarships to college. TR: How does this relate to your other life as an artist? J: To me, this is what hip-hop does: We empower people. I've watched us change the narrative about black men and education. Men have become better fathers, better human beings. They're transforming how they're working. They show up in other classes like, "I'm not getting caught up in the matrix; actually we were not slaves, we were enslaved." Our goal is to be a part of the national conversation about programs that actually work that serve our black males. TR: How do your two worlds intersect? J: I was born and raised during the golden age of hip-hop. Public Enemy. Poor Righteous Teachers, Rakim, KRS and Africa Bambaataa. Bambaataa put in my ear that when you're not on the stage, you're serving your community. I left Cleveland right after my career started in 1999. I was the only Cleveland artist that performed at the Rock and Roll Hall of Fame with Public Enemy, and that's where we met. PE, Outkast, Goodie Mob and Nas were on that bill. I met PE backstage, and it was just a really good connection and we stayed in touch. I did a documentary film called Redefinitions, and Chuck got wind of it and got in touch with me and helped me to get distribution. It really was a friendship. Chuck told me to get a passport and take your hip-hop around the world. I took him up on it. Went to Europe, got a deal with EMI for my album SoulHop:The Breakthru in Europe and lived in Copenhagen for almost two years. It was incredible. Watching Danish people really respond to socially conscious, profanity-free, life-affirming hip-hop. I like to rock live, and they really like live performances. TR: How did the funk bands in Ohio influence you and the consciousness of Oakland influence you? J: Growing up with Roger Troutman and Zapp and Bootsy Collins, it was the birthplace of funk. All of that influenced me. For me, vinyl records and Soul Train were the most important things to me. Soul music caught my imagination. It felt good. I could tell the vibe of my family based on what they would play. If Mom is playing Aretha Franklin on Sunday, I know I'm having pancakes. But if she's playing "Make Me Wanna Holler," you may want to wait before you ask her something. For me, Oakland, the history of the Black Panthers … it's not like a museum. Emory Douglas lives in Oakland still. Look at artwork for the Black Panther Party; that's Emory Douglas. I saw him two weeks ago. We have living legends from a time period who are still here and still active. TR: Tell me about your new album, InsPirEd. J: In 2006, Public Enemy was celebrating the 20th anniversary for A Nation of Millions. I was the official emcee and host. That's when Chuck began the seeds of PE 2.0. He hit me up on the text and said, "James Brown/Bobby Byrd." I knew exactly what he was talking about. Just the ability to be able to find your lane and add something to keep it funky. I was a host and I also got a chance to perform. Twenty-eight years for PE, it's unprecedented for hip-hop. Chuck could have called anybody in the world, but he was like, "Jahi, I really feel like you've earned this opportunity." P.E. 2.0 stands for Project Experience millennium. It's a new branch on the Public Enemy tree. We do cover songs from their latest catalogue. I did Jam Master Jay's version of "Louder Than a Bomb." Have access from a lot of instrumentals from their discography, and it's my job to create new songs that speak to the times. KRS-One is on the track "BLK THSS" and Easy Mo Bee is on "CRWDRCKRS" and "BLKLVMTTRS." I've been knowing KRS since 1998. He's my friend and my brother. I met him at Cleveland University. I walked up to him, introduced myself, told him I wanted to be the opening act. He was the keynote speaker. He was like, "Bust right now, 24 bars." I spit, and he says, "Meet me backstage at 2 a.m." I'm thinking, "Doesn't the club close at 2?" But it was a rave. They can go till 5 to 6. I rocked that show. He took me on tour. D.C., Philly, all over the place. The cultural knowledge that I got from him was priceless. He came out and did our Black History Month program at the school recently. TR: I love the album; it sounds like 1994 again. J: Well, I am the age of hip-hop.